Antique Oak Housekeepers/school Cupboard. 6ft x 4ft x 14” Solid oak, very heavy. It will take 2 people to move. It has a very nice cornice and solid base, with solid back. It is stamped LEC Elementary, which is Lancashire Education Committee. It is probably very early 20th century. Collection only, I can assist with moving the cupboard and will be happy to deal with your movers. 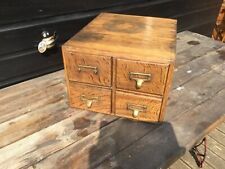 Vintage Oak Filing Cabinet. Good Condition considering it's age. The drawers inside have been repaired but still work well and look pretty good. Would have many uses including as storage in any living space and bedside cabinet. Local collection from Lancaster or you arrange your own courier. Any questions feel free to ask. 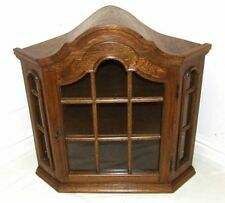 Beautiful original solid oak antique display cabinet, with 3 shelves 2 of which are adjustable. Former owner used it as a book case for many years, with the original lock and key. All glass is is brilliant condition and with no rot or warm this is a great piece of furniture. The unit measures 116cm high x 92cm wide x 26cm deep Please feel free to have a look at my other items. Cash on collection unless confirmed otherwise Delivery can be arranged on certain items at a cost of 50p per mile to the drop and 20p a mile return trip. Used item but in good condition. By request. LS WF HD HX BB BL PR FY WN. LN DN S ST SK M WA OL CW CH L TA. DT BH BA BS HR WR CV B DY WV TF WD DE LE PE NR NG. CO CB IP NN GL SN SP SO PO. Antique Or Vintage Oak Cupboard made by Disabled Soldiers & Sailors Bournmouth. The measurements are: 13.5” tall (35cm) 10.5” wide 10.5” deep A lovely little cupboard with interior shelf and in great condition. Collection from Yeovil or you could send Shiply to collect. New listingOld Charm Bureau writing desk storage study cabinet. sturdy Solid. Paint. Old Charm,Wood bros Bureau writing desk storage study cabinet. Sturdy and solid. With linenfold drop down and linenfold doors. lid supports move in nd out very well. Clean and tidy long drawer which has dovetail joints. 2 linenfold doors open to reveal good sized storage space - inner half shelf is missing. Could paint / shabby chic. Measurements are: Width Depth Height I have tried to photograph and describe the bureau to show its true condition so please see photographs as they do form part of the description. I do have other vintage / antique items on my other listings. Please feel free to ask any questions. Vintage corner cabinet with 2 internal shelves and lockable closure. This cabinet is in good condition but has added pieces of timber at the sides as it was attached to an uneven wall (these could be easily removed). Dimensions are 1117 x 360 x 360 mm, contents seen in photo not included. The drawers are 55cm in length, with an internal width of 10cm and height of 6.5cm. In sturdy condition with a chic industrial factory look. Large Antique Solid wood believe to be oak with oak veneer to sides and top. Very solid piece of furniture with twin draws and big storage space, as you can see from the photos could do with some tlc to the veneer but I won’t personally leave it as it shows it’s story. It’s from 1941-1951 as the stamp shows. The cupboard measures 123cm high x 84cm wide x 46cm deep Please feel free to have a look at my other items. Cash on collection unless confirmed otherwise Delivery can be arranged on certain items at a cost of 50p per mile to the drop and 20p a mile return trip. Upcycled 1950's Sideboard Drinks Cabinet Record Storage. Can be used as a tv stand without legs. Photo 2 shows example on small blocks (no included). Great for Record / Vinyl Storage. Records in Photos not included. Vintage Old Charm Oak Sideboard drinks cabinet. 5ft wide 3ft 3 inches tall 1.8ft deep. A vintage Oak Fronted corner cupboard with two interior shelves. It has thick pine backboards and is very heavy. It is a good quality cupboard. There are brackets on the back for hanging on wall. Height. 31 inches. Width. 28 inches. Depth. 15 1/2 inches. Payment by PayPal please. COLLECTION ONLY. Thanks for looking, please see my other items for sale. Antique Oak Bureau with Sliding Glass Bookcase. 4 drawer index file cabinet. The drawers are in good condition, all pulling well. Oak Book case. Mainly made of solid oak. Back made of an unknown wood. One of the shelf lugs is missing. Size 120 cm x 100 cm x 27 cm Age unknown but inspection welcome. Item is located in Sussex. Collection in person only from Bourne, Lincolnshire. Stunning hand carved oak corner cabinet. Welsh carvings. There are 3 internal shelves providing a very decent storage space for various nick nacks. Width around: 72cm. Early 20th Century Art Deco Hallway Cabinet For Coats | Vintage Utility Cupboard An elegant vintage hallway cabinet for coats. This early 20th Century cabinet is beautiful in proportion; tall and slim. It is simple in design with a few set deco details like the rounded top at the front and a pretty key. Made in oak and plywood. Inside the antique hallway coat stand has a rail for hangers and hooks. Perfect size for a 1920’s or 30’s semi detached house hallway. Size; height 179cm, width 69cm, depth 41cm. Very good vintage condition with lovely colour and patina. The finish is a beautiful caramel shade of brown. Clean inside. Working lock and key. Please send us your postcode for a delivery quote. 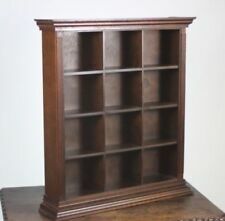 This is a standard Old Charm book case in a lovely warm colour, No damage. This stunning sideboard is hand carved with two drawers over twin panelled cupboard doors. 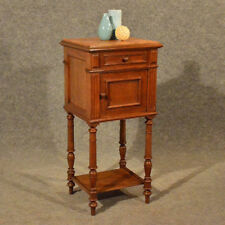 This was originally a very expensive item of furniture and as you would expect is complete with dovetail joints. Staverton manufactured furniture ranges for the Crown Suppliers and this developed into contracts for. The bookcase is solid oak with solid block feet. (One into 2). 36cm (14.17") Deep. 56cm wide x 41cm depth x 63cm high. Original Edwardian Glass Fronted Chest Of Draws - 20th Century Drapery Store Cabinet - 6 Fully Functioning Glass Fronted Drawers - Material: Oak Wood Dimensions: - Height; 110cm - Width; 51cm - Depth; 36cm Cash Only. Any queries please do not hesitaste to contact me. Has four drawers which take foolscap sized suspension files.